Sukanto Tanoto was born in Indonesia in the Sumatran city of Medan on Christmas Day in 1949 to a migrant couple from Putien, Fujian Province in China. 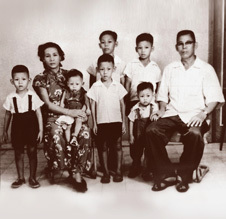 The eldest of seven boys, Mr. Tanoto was educated in a Chinese school and never learnt Bahasa Indonesia formally (though he is now fluent in the language). In 1966, at the age of 17 he left high school before graduating to join his father who was then running a three-man firm in Medan and supplying spare parts to oil and gas companies. Young Sukanto took over his father's business as the eldest son of the family. Gradually, Sukanto built up the business and moved it beyond trading to building gas pipelines for multinationals. The business took off during the 1972 oil crisis, when oil prices surged following the first Middle East oil embargo. During a visit to Taiwan, Mr. Tanoto realized that Indonesia was exporting logs to be converted to plywood and then importing the finished product back at higher costs. He believed that he could process the logs locally. In 1973, he set up RGM and entered the plywood business after convincing the government to give him a permit required to build a plywood factory. The factory was completed within 10 months - more than four months ahead of schedule. Following this success and his growing reputation as someone who could make things happen, the Indonesian government, whose economic development objective included the oil palm sector, requested he enter the palm oil industry where he quickly established a fully integrated operation from plantations to refineries. As Sukanto Tanoto’s operations grew, he and his wife also started to become involved in the social responsibility side of business, building kindergartens and schools, initially for his employees but eventually for the communities in which the company operated. Mr. Tanoto’s next business foray was in 1988 when he established plantations and a manufacturing plant near Lake Toba in Sumatra, Indonesia, to produce paper pulp and dissolving pulp. This was followed in 1994 with the formation of APRIL (Asia Pacific Resources International Limited), Mr. Tanoto’s flagship pulp and paper business, with plantations and pulp and paper mills in Kerinci, Sumatra, Indonesia. By 1995, commercial production of pulp had begun and two years later, construction of a second pulp line was underway. As he expanded his business, Mr. Tanoto realised that if he was to become a global player he needed English language skills. This determination motivated him to learn English word-by-word, using a Chinese-English dictionary while reading three magazines - Life, Reader's Digest and Newsweek. Sukanto Tanoto also recognised that understanding modern business management was essential. Accordingly, he resumed his formal education, attending courses at such prestigious schools as INSEAD, Harvard, Wharton, and Carnegie Mellon. In 1997, the business, like nearly all operations in Asia, was hit hard by the Asian Financial Crisis. It was a crisis of unparalleled severity, bankrupting companies, causing bank closures and bringing down governments as well as throwing tens of thousands of people out of work. In the case of APRIL, the mill was not yet fully operational and borrowings ballooned by 50% as currency fluctuations increased the amount owed. To complete the mill, Mr. Tanoto sold off some assets and reorganised his debt. Unlike a number of other businessmen of the era, he did not walk away from any obligations and met all his financial commitments without receiving any discounts. One of the most valuable lessons Sukanto Tanoto learned from the Asian Financial Crisis was the need for corporate social responsibility (CSR). “You have to look after your people. That does not just mean your employees. It includes the community,” he said. “It is not just a matter of educating people by building schools. People have to eat, they have to survive. So when governments cannot meet their needs, you have to step in. During the height of the crisis, APRIL established a Community Development committee and started what has become a highly successful program to improve people’s lives. Its Integrated Farming Scheme teaches villagers how to farm on a sustainable basis. It integrates horticulture with raising livestock, freshwater fish farming, composting and waste recycling. Farmers are provided with start-up assistance including cattle and/or fish and seeds as well as the necessary training and technical assistance to move away from destructive slash-and-burn agriculture and improve their incomes. As the Asian Crisis receded, Mr. Tanoto completed the APRIL mill in Kerinci and looked around for further opportunities. The new millennium saw a move into the energy resources sector with the establishment of Pacific Oil & Gas (PO&G). Its initial operations involved oil exploration and production blocks off the coast of Sumatra., Indonesia. Today, its operations also include development of natural gas fields in Indonesia as well as LNG receiving terminals and large-scale Combined Cycle Gas Turbine power plants in China. In 2003, Mr Tanoto acquired two companies in Brazil – a dissolving wood pulp mill and a plantation company. By integrating their operations while also building the first wholly foreign owned viscose staple fiber mill in Jiujiang, China, he established Sateri Holdings Limited as a new force in the specialty cellulose industry. Dissolving wood pulp and viscose staple fiber, produced from renewable and sustainable plantations, is used in an extensive range of end-products such as cosmetics, foods, textiles, baby and facial wipes, nappies (diapers), pharmaceuticals, toothpaste, detergents, shampoos and paints. In 2008, the design capacity of the Brazilian mill was more than doubled to 465,000 tonnes per annum of dissolving wood pulp and its products expanded to make Sateri the supplier of the broadest range of dissolving wood pulp in the industry. In China, Mr. Tanoto further extended his operations through the acquisition of 90% of SSYMB, a pulp and paperboard mill in Rizhao and its incorporation into APRIL. Subsequently its capacity has been increased to more than one million tonnes of pulp with plantations established to provide fiber. While growing his business, Mr. Tanoto also reorganised his approach to CSR and philanthropy recognising that this needed to be carried out on a more strategic basis if it was to remain effective. Accordingly, in 2001 the Tanoto Foundation was founded to coordinate the philanthropic giving and social work of the family. For further information about Sukanto Tanoto’s businesses and the Tanoto Foundation, click here or on the links above.